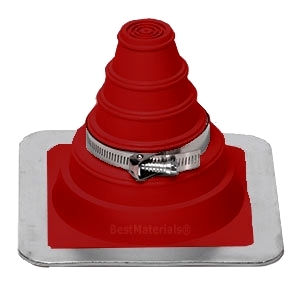 PRODUCT: #3 Silicone Deck-mate, Red Color, with Stainless Steel Clamp. 7.6" X 7.6" Base, 5.6" High, Closed Top. Fits 1/4" - 4" (6mm To 102mm) Pipes. Price/Boot. Pipe boot is molded with a 5/8" sealing band for each pipe size. An adjustable stainless steel pipe clamp (included) tightly clamps any pipe size selected and forms a permanent seal. The flexible base is virtually compatible with any roofing material -- metal, plastic, asphalt, tile, rubber membrane, and easily conforms to irregular surfaces. Base is reinforced with a heavy-duty aluminum alloy clamp ring for flexibility and a tight seal at the base. Stepped-pipe design makes easily adaptable to most roof pitches.